Magic ISO Maker is a powerful CD/DVD image file creating/editing/extracting tool. Magic ISO Maker can open / create / edit /extract CD/DVD image files & convert bin to iso and back as well as make ISO file from DVD/CD-ROM or hard disk, and handle bootable information at meanwhile. Magic ISO Maker can convert BIN or any other format file created by CD burning software or virtual DVD/CD-ROM driver software. Magic ISO Maker can convert ISO to DVD. ...... containing exact binary copies of the original CDs. Usually, you have to burn an ISO file on a CD to extract its contents, but now you can simply open an ISO file in MagicISO. Magic ISO Maker can convert ISO to DVD. Magic ISO Maker can also convert BIN or any other format file created by CD burning software (Such as Nero-Burning ROM, Easy CD Create) or virtual DVD/CD-ROM driver software (such as Daemon-tools) to standard ISO format. 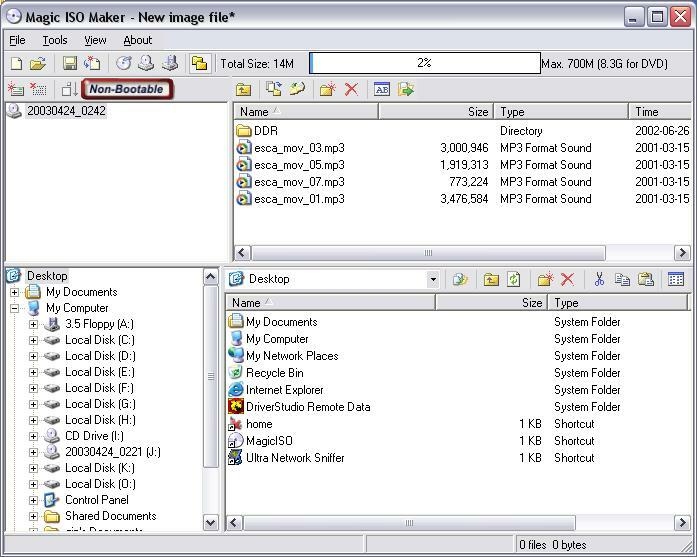 Magic ISO Maker has ability to create ISO image file. You can directly add/delete/rename files or folder in CD image file(s) with MagicISO. MagicISO can handle up to 10G large sizes so that user can extract / edit / open DVD image files in ease. Qweas is providing links to Magic ISO Maker 5.5 (build 276) as a courtesy, and makes no representations regarding Magic ISO Maker or any other applications or any information related thereto. Any questions, complaints or claims regarding this application Magic ISO Maker 5.5 (build 276) must be directed to the appropriate software vendor. You may click the publisher link of Magic ISO Maker on the top of this page to get more details about the vendor.